Poll: Who’s your favourite movie character of all time? Characters make movies. Whether you’re following them on an adventure or falling in love with them, they make the big-screen experience what it is. All the visual effects in the world don’t mean a thing if you don’t have a great character to pull you into the story and make you care. 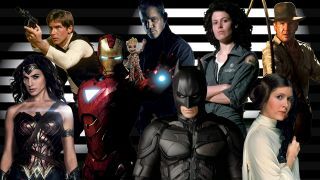 Our sister magazine Total Film wants YOU to vote for your favourite characters ever, so it's time to start whittling down your picks. Who are the movie characters that inspire you? The ones you’d follow across any franchise? The heroes you root for, and the villains you love to hate? Whether Han Solo’s the only one for you, or if you think Katniss Everdeen is always on target, or if James Bond has got your number, TF wants to know about it! All you need to do is skim through the list below (it’s in alphabetical order by first name/hero name) and pick your 10 favourites. No need to panic if you don’t see your top choice on the list – you can add your own entry at the bottom. The poll closes on Sunday September 10, 2017, and the results will appear in a future issue of Total Film magazine, so you can see which character won the vote to be crowned the greatest ever! Who is your favourite movie character of all time?